5 Seconds of Summer in Montreal or Quebec City? Inform me about the next events for 5 Seconds of Summer. Enroll yourself to our priority waiting list for 5 Seconds of Summer to be alerted when new tickets are available. Filling this form doesn't engage you to any purchase. 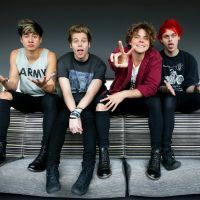 5 Seconds of Summer is coming to Montreal on July 13, 2016 for a concert at the Bell Centre. On their previous tour, 5 Seconds of Summer performed in Toronto but didn't stop by Quebec. This time around, they will not skip Montreal! The Australian pop-rock band released their second album Sounds Good Feels Good in October 2015. Don't miss 5 Seconds of Summer this July!